promenade when a lone man in coveralls approached me. I smiled at both the man’s abrupt introduction and his unusual appearance. glasses and looked to be about 40 years old. “America!” the man exclaimed. “I have an American nickname: Harrison. “Why do you smile?” Harrison asked me as we went down the winding back streets of Larnaca in search of the tomb. Lazarus or no Lazarus, I had never planned on going to the Mediterranean island of Cyprus in the first place. Originally, my plan had been to find a direct flight from Rome to Cairo. I’d soon discovered, however, that Cyprus Air offered passage to Cairo at less than half the cost of other airlines. The only catch was a 24-hour layover in Larnaca. Always a sucker for cheap airfare, I went for it. “Do you believe in Lazarus?” he asked as we made our way to the tomb. get a visa to America?” he said in a quiet voice. 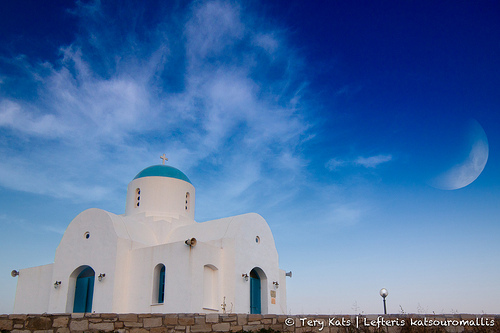 St. Lazarus Church is a sturdy stone structure in a clean courtyard not far from the old Larnaca Fort. Harrison waited outside as I entered to discover a narrow maze of wooden pews, vaulted ceilings and curving stone-block columns. Ornate chandeliers hung from the stone arches, and an intricate gilded iconostation dominated the front of the church. Byzantine saints with golden halos peeked out from every wall and corner. A painted wooden altar in the middle of the church contained a silver crucifix and large glass disc fastened down with a ruby-studded rim. Beneath the glass was the yellowed crown of a human skull. Harrison unzipped his coveralls and took out a small, dogeared notebook. still skeptical at his odds for a new life. through the Byzantine museum and examine the marble graves in the adjacent Protestant merchant cemetery. sanctuary to get one more look at what may or may not have been the bones of a man who may or may not have been raised from the dead.